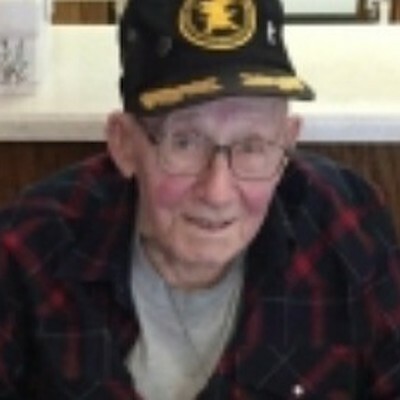 Kenneth Charles “Kenny” Kakac of Frederic, Wisconsin died peacefully at the Luck Nursing Home on April 9, 2019 due to heart complications. Kenny Kakac, the son of Adolph and Marie (nee Kubicek) Kakac was born in Maple Leaf, Iowa on March 26, 1929 and was baptized at the Presbyterian Church in Saratoga, Iowa. When Kenny was one year old, his father died on April 21, 1930 in Cresco, Iowa leaving his mother to raise five children. His mother married Joseph Falteisek Sr. on June 23, 1931 in Ellsworth, Wisconsin. Joseph’s wife had recently passed away leaving him to take care of seven children, the youngest being a baby of four months old. Because of their situation in raising large families during the Depression, Joseph Falteisek and Marie Kakac met through a personal ad and raised the Kakac and Falteisek children in Trimbelle, Wisconsin where Kenny grew up and attended school. Kenny was drafted into the Army in 1951 and served his country in Germany for 20 months before being Honorably Discharged in 1953. Kenny married Delores Eckstrom in Hudson, Wisconsin on August 19, 1950. They made their home in Prescott, Wisconsin where Kenny was a mechanic at Cernohous Chevrolet and also operated his own repair shop. Delores passed away on June 28, 1972. Kenny met his future wife, Arlene (nee Sund) Erickson in 1973. They married in Frederic, Wisconsin on July 20, 1985 and made their home on Spirit Lake in Frederic. There were many wonderful memories made at the “lake” over the years. Arlene passed away on February 24, 2012. Kenny was preceded in death by his parents, step-father and wives; step-son, Barry Erickson; siblings, Rudy Kubicek, Edward Kakac, Gladys Malone and Walter Kakac; two half-brothers, LeRoy and Raymond Falteisek; seven step-siblings, Emil Falteisek, Rudy Falteisek, Mildred Urbanski, Josephine Drevnick, Joseph Falteisek Jr., Mary Ann Even and “Richard” Frank Falteisek. Kenny is survived by his step-children, Randy (Donna) Erickson and Jill (Todd) Route; step-daughter-in-law, Deanna Erickson: step-grandchildren, Heather Erickson, Rex (Heidi) Erickson, Amanda (Jordan) Hammond, Toby (Ryan Nelson) Erickson, Katie (Joe) Tolan, Adam (Emily) Erickson, Sara Route, and Nick (Shannon) Route; many step-great-grandchildren; niece, Karen Kakac; sister-in-law, Sylvia Falteisek; many nieces, nephews and friends. Funeral services will be held Monday, April 15th, 2019 at the Rowe Funeral Home in Luck, WI - visitation will begin at 9:00 AM with the service at 10:00 AM. Interment will be in Prescott, WI. Arrangements are entrusted to Rowe Funeral Home.